Ingenuity Marketing Services, based in Los Angeles, California, becomes your marketing department, enabling you to focus on the core competencies of your business. You SHOULD be getting better results from your marketing dollars! is a “best value” solution through which growing businesses are able to access a range of state-of-the-art services and resources. 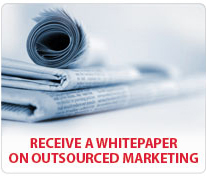 Outsourced marketing results in a shift from an internal to an external marketing department. The benefits are numerous: in addition to a sizable cost savings, outsourced marketing allows you to better focus your resources, free up time of valuable personnel, project a more professional appearance, access better technology and capabilities, leverage increased flexibility, and much more. A proactive, strategic and completely integrated marketing program will deliver exponential results! At Ingenuity Marketing Services, we provide a complete outsourced marketing solution so that all marketing activities are proactively managed and optimized to work together. The results are proven to be exponentially better when the individual marketing components are integrated, designed and executed to complement one another. Our Los Angeles based team becomes your company's complete marketing department, which enables you to focus on the core competencies of your business while also benefiting from a proactive marketing program. Outsourced marketing provides your company the benefit of a world-class marketing department, which includes: a VP of Marketing, brand managers, art directors, web designers, media planners, social media gurus, public relations experts, market researchers and talented strategists. We start by analyzing your current business. We begin with a thorough analysis of your current business situation and use this information to create a powerful marketing strategy and comprehensive marketing plan. This allows us to set progressive annual targets that will help you reach your business goals. We don’t just recommend the strategy and leave it at that; we implement your marketing plan including: marketing materials, sales and training tools and support, internal and external communications, advertising, promotions, social media, viral marketing, website design & SEO, events, and more…so you can focus on your business. We continue to track and measure the success of the integrated marketing strategy. the greatest opportunities are leveraged for the growth of your business. difference between the success and failure of a business. Not only is it better to remove these distractions from your plate; but in today's marketplace, it is also crucial to benefit from professionals with the knowledge and expertise to maximize your ROI. Get in touch with us to see what an outsourced marketing firm can do for your business. Click Here to contact us now. © 2010 Ingenuity Marketing Services, Los Angeles, California. All Rights Reserved.